CASSTOWN — Fort Loramie survived a scare from Miami East on Saturday and won a nonconference game 46-43. The Redskins struggled for the first 28 minutes to get the ball to go into the rim in part due to turnovers and lack of ball movement against Miami East’s zone pressure. Miami East led 7-2 at the end of the first quarter. Fort Loramie outscored the Vikings in the second quarter 11-8 but still trailed by two points at halftime. Miami East outscored the Redskins 13-5 in the third to take a 28-18 lead. Fort Loramie trailed by eight to 10 points for much of the fourth quarter. The Redskins were down seven with under 20 seconds left when Taylor Ratermann drained a shot and was fouled. She hit the free throw to put Loramie within four with 12 seconds remaining. Miami East tried to go long on the inbounds play, but the ball went out-of-bounds. 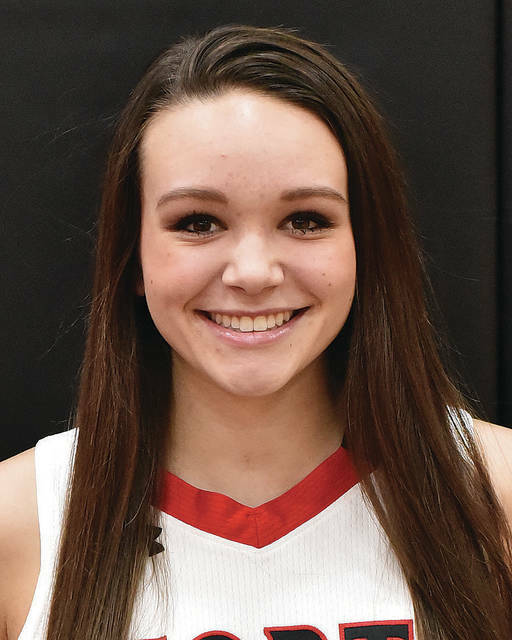 Fort Loramie got it on the baseline as a result and Ava Sholtis grabbed an offensive rebound for a putback to bring the Redskins within 38-36 points. After an inbound pass to Morgan Haney, Fort Loramie doubled team her. A jump ball was called to give the Redskins one last possession. With two seconds remaining, the ball was thrown into Dana Rose, and she hit a two-foot shot as the buzzer sounded to send the game to overtime. Marissa Meiring hit a 3-pointer on the first possession in overtime to put the Redskins up and then hit a basket on the next possession to extend the lead to five points. Fort Loramie went 3 for 6 from the free-throw line to win the game. Ratermann finished with 10 points, Meiring had eight points and eight rebounds and Sholtis has nine points and seven rebounds. Kenzie Hoelscher led the squad with 10 rebounds. The Wildcats took control by halftime and cruised to a nonconference win over Anna on Saturday in Minster. Minster took a 16-5 lead by the end of the first quarter thanks in part to five points by Ivy Wolf. The Wildcats led 23-13 at halftime and 37-23 at the end of the third quarter. Wolf and Courtney Prenger each scored 16 for Minster. Kiplyn Rowland led Anna with eight points. The Rangers used a big third quarter to beat Botkins in a road nonconference game on Saturday. New Knoxville led 18-10 at halftime and outscored the Trojans 20-3 in the third quarter to pull away. Jacklyn Leffel led New Knoxville with 12 points while Erin Scott and Megan Jurosic each scored 11. Taylor Doty added 10 points. Boston Paul and Makenna Maurer each scored six points for the Trojans. The Pirates held Fairlawn scoreless in overtime to earn a nonconference win on Saturday in De Graff. Riverside led 13-11 at the end of the first quarter and 22-20 at halftime. The Pirates maintained a 32-30 lead heading into the fourth but the Jets forced overtime with a 35-35 tie. Kalin Kreglow led the Pirates with 13 points and 11 rebounds while Shelby Giles had nine points and Dana Jones chipped in six. Riverside shot 14 for 47 (29 percent) from the field and outrebounded Fairlawn 32-25. “Our shooting was atrocious once again,” Hodge said. “We got good looks all day we just couldn’t get anything to fall from the field or free-throw line. Hopefully we are able to correct that as we move into next week’s games. Lauren Dudgeon led Fairlawn with 17 points and eight rebounds. The Jets shot 13 for 49 (26 percent) from the field. The Red Devils capitalized on 34 turnovers by the Yellow Jackets and cruised to a Greater Western Ohio Conference American North Division game on Saturday in Sidney. Hallie Truesdale led Sidney with five points. The Yellow Jackets shot 5 for 22 (22.7 percent) from the field. The Tigers earned a win over Russia in the final seconds of a nonconference game on Saturday thanks to a basket by Taylor Gray. Arcanum led 11-6, 20-15 and 31-22 at the quarter breaks. Laurissa Poling led the Raiders with 15 points while Jenna Cordonnier scored 12. The Buccaneers took a 13-2 lead by the end of the first quarter and cruised to a nonconference win over Jackson Center on Saturday. Covington led 24-16 at halftime and 36-22 at the end of the third quarter. Kylie Hartle led the Tigers with 10 points while Raquel Kessler scored seven. The Cardinals took a 23-6 lead by the end of the first quarter and cruised to a home nonconference win on Saturday. Madison Cordonnier led New Bremen with 22 points while Kelly Naylor scored 14. The Cavaliers lost a close nonconference game with St. Henry on Saturday. Lehman Catholic trailed 14-13, 31-25 and 37-29 at the quarter breaks. Carly Edwards had a big game for Lehman with 21 points and 10 rebounds. Lauren McFarland had 10 points and three steals, while Anna Cianciolo filled out the stat sheet with six points, four assists and four steals. The Jets earned a nonconference win in Casstown on Saturday. Skyler Piper had 25 points and Ashton Piper added 18 to lead Fairlawn. Fort Loramie got off to a quick 6-0 lead after 3s by Jake Ratermann and Nathan Raterman and led by at least six the rest of the way in a big home nonconference win on Saturday. The Redskins led 12-5, 25-12 and 36-17 at the quarter breaks. Nathan Ratermann led Fort Loramie with 10 points while Nick Brandewie scored eight. The Tigers took a 12-0 lead by the end of the first quarter and never looked back in a road nonconference win on Saturday. Jackson Center led 23-9 at halftime and 35-24 at the end of the third quarter. Trent Platfoot led Jackson Center with 21 points while Aidan Reichert scored 10 and Christopher Elchert added eight. Nolan Bornhorst led the Cardinals with 19 points while Bryce Blickle finished with eight. Michael Stammen had a career game as Versailles defeated Russia 65-49 on Saturday. The Pirates took a 15-7 lead by the end of the first quarter and cruised from there to earn a nonconference win on Saturday in De Graff. Riverside led 29-16 at halftime and 36-27 at the end of the third quarter. “I was happy with the way we came out,” Riverside coach Seth Bodenmiller said. “Our aggressiveness from Friday night’s game really carried over and we got off to a good start. While we still had a lot of mental mistakes throughout the game on the offensive end. We were at least able to hold our own on defense. Kyle Knight led the Pirates with 16 points while John Zumberger scored 10 and Lane Willoby added eight. Willoby led the squad with 11 rebounds. Riverside shot 18 for 46 (39.1 percent) from the field and had 33 rebounds. Sidney’s boys bowling squad finished fifth while the girls were 13th in the Boro RollOff tournament in Springboro on Saturday. Jaxon Rickey made all-tournament team with a 680 series for the boys squad. Logan Finke had a 608 series and Drake Cromes had a 585 series. The squad was fifth out of 22 teams. “I was happy with our play today,” Sidney coach Trent Knoop said. “We’ve been doing a poor job with our spare shooting, but I thought today was much better overall. We let ourselves be in good position all day (standing wise). We unfortunately didn’t make it to the top four, but I’ll take fifth place. We did a good job. The girls were 13th out of 20 squads. Camryn Smith had a 485 series, Sarah Bell had a 422 series and Kate Miller had a 384 series.